Zeltiq (pronounced Zel ′teek) CoolSculpting in Bangkok offers a new non-surgical liposuction treatment for the reduction of stubborn unwanted fat tissue and weight loss surgery and offer a great alternative to minimally invasive lipo procedures such as SmartLipo,Bodytite and Vaser. 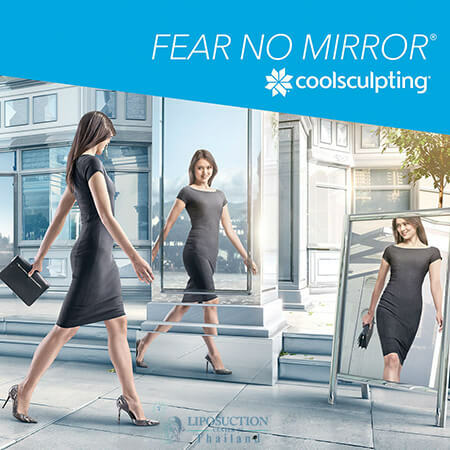 The Zeltiq CoolSculpting utilizes a patented method called Cryolipolysis (the use of precisely controlled cooling to remove fat) that is designed to target only fat cells and not harm the skin or other tissue. The procedure is non-invasive and targets only unwanted fat cells, there is no recovery time after the procedure. Currently the device along with cellulaze and Zerona are only FDA-approved in the U.S. for skin cooling and anesthetic uses, however Zeltiq Coolsculpt Liposuction style machines are used in Europe and Canada for fat reduction. Following the Coolsculpting Procedure, the affected fat cells are gradually eliminated through the body’s normal metabolic processes, like fat from food. The result is a gradual reduction and smoothing of fat bulges that is apparent in most patients in two to four months. The Coolsculpt procedure is completely non-invasive, which allows return to normal activities on the same day as your procedure, such as air traveling, work or exercise. Redness may appear in the treated area, which may last from a few minutes to a few hours. Some localized bruising may occur, which clears within a few weeks. Many patients experience a temporary dulling of sensation in the treated area lasting one to eight weeks. When the Zeltiq Coolsculpting procedure begins, patients may feel a cooling sensation in the procedure area. This sensation goes away in a few minutes. Patients typically sit or lie down during the Coolsculpt Liposuction procedure, depending upon the area being treated. The Zeltiq Liposuction procedure is comfortable for most patients; they can read, listen to music, work on a laptop, or simply relax during the procedure. Procedure time for Zeltiq Coolsculpt can be two hours or more depending on the size of the area to be treated. No pre-procedure preparation is required for Freeze Liposuction; no general/topical anesthesia or pain medication is needed. The ideal candidate for the Freeze Liposuction is seeking to decrease specific areas of fat, such as abdominal fat, love handles (flanks), and/or back fat. Patients opting for the Zeltiq CryoLiposuction are generally interested in a effective noninvasive therapy offering noticeable but modest results. The CoolSculpt Liposuction procedure is not intended for weight loss or obesity; nor is it a substitute for surgical liposuction procedures that remove a large volume of fat. A good candidate should be relatively fit and have modest-size fat bulges in areas that are not easily reduced through diet or exercise.The majority of patients undergo just one Freeze Liposuction fat removal procedure. Some patients have 2-3 total procedures for continued fat reduction. The cost of getting CoolSculpting depend on the areas being treated with huge discounts offered for multiple areas. To get the lowest prices for Coolsculpting in Bangkok Thailand please contact us today. At Liposuction Center of Thailand we promise to guide you from start of your Coolsculpt holiday till the finish. Safety First! We will NEVER Jeopardize patient health by using inferior or Counterfeit “Cool Freeze” Coolsculpting equipment from China. We coordinate and handle all your treatment bookings and details and personally manage the proper administration of all your medical records including Continuity of Care Documents (CCD) if applicable. We can arrange flights, passports & visa related needs. Door-to-Door service Option: an English speaking person will pick you up from the airport and take you directly to your hotel and appointments. Our team will be in touch with you all the time to make sure that your stay is comfortable. After returning home from your Liposuction vacation we contact you and facilitate any follow up conversations with the doctor that need to happen. We welcome the opportunity to give you the information about your Coolsculpting procedure that you need to make the most informed decision as you consider the Liposuction Center of Thailand. Communication, mutual trust and confidence are necessary to ensure a successful Coolsculpting treatment. We encourage you to ask questions, and will take all of the time that is needed to answer them thoroughly and to your satisfaction. Genuine Coolsculpting is Currently ONLY available in Bangkok. We do not Offer Coolsculpting in Phuket, Pattaya or Chiang Mai at this Time.